The B&W Company makes a folded dipole that claims to have a good match on all bands and it does. However, on the low bands much of the power is burned up in the resistor that connects the two ends together. The power going toward the ends encounter the resistor and is consumed as heat. All that power is lost and does not radiate, and no power is reflected back to the feed point making the antenna have low SWR. On the higher bands, a large part of the power radiates before it reaches the resistor and the antenna is moderately efficient on those bands. On 80 meters the 90 foot-long dipole model will produce a signal at least 10 dB lower than that from a resonant dipole. If you remember the single channel TV antennas used years ago, the driven element was a folded dipole. Folded dipoles are very broad-banded. That is the reason they were used for TV antennas since a TV channel is 4 MHz wide. When constructing a folded dipole, the formula for calculating the length of it is the same as for any dipole. The folded dipole consists of two parallel conductors with the ends tied together. The conductors can be spaced from less than an inch to more than two inches apart when made from TV ribbon or ladder-line. At the ends, strip the insulation back several inches, Twist the bare wires together, solder them, and run them through insulators. The feed-point is in the center of only one of the two parallel conductors. The feed-point impedance of a folded dipole at resonance is close to 300 ohms resistive and can be fed directly with 300-ohm TV twin-lead or a tuner with its balun. This antenna was very popular years ago when coax was expensive and 300-ohm TV twin-lead was relatively cheap. A length of 450-ohm can be substituted for the twin-lead. An alternate feed method is placing a 6:1 balun at the feed-point and then feeding it with 50-ohm coax. 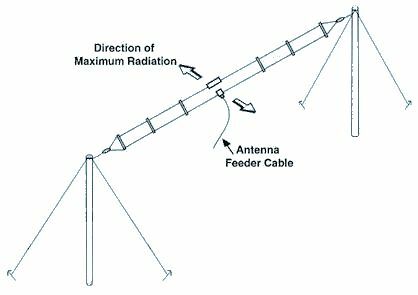 The folded dipole will not radiate its second harmonic, so it is not good for a multi-band tuner-fed antenna.